Our vision for a sustainable future means not only serving our customers, but also their communities. We are committed to investing in rural and developing communities to improve their quality of life. From 2012 to 2015, we gave back through four major initiatives: food and relief operations, the environment, health and education. Food and Relief Operations – Proper nutrition is a key part of our business, and we are grateful to provide food and other necessities to vulnerable communities. We organized 15 feeding programs in UP Diliman and served 2,300 meals to UP Tacloban students displaced by Typhoon Yolanda. We delivered 5 feeding programs in Pampanga and served 900 meals to underprivileged residents. After calamities such as Typhoon Yolanda and Typhoon Lando, we took decisive action and coordinated 26 relief operations across Pampanga, Bulacan, Pulilan, NCR and Tacloban—distributing 20,677 relief packages. Environment – We understand the importance of clean water in nourishing aquatic life and the health of surrounding communities. In our home province of Bulacan, we partnered with BFAR and cleaned up Calumpit River, the most important river system in the province. 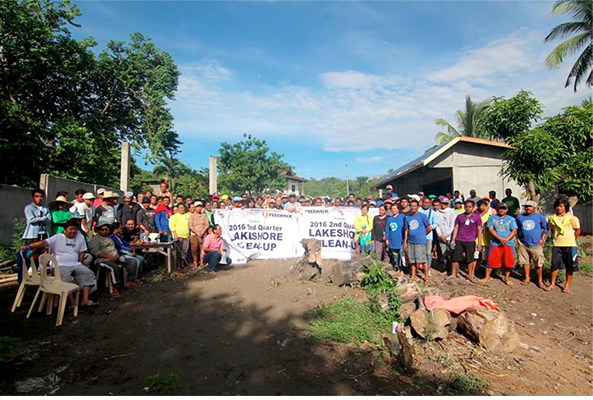 In Batangas, we conducted 7 clean up operations around Taal Lake with the help of residents and neighborhood organizations. We are thankful to work with the aquaculture farmers of Taal Lake, and their abundant tilapia harvests is a source of pride for their community. Health – The health of a community depends on the health of every individual, especially when it comes to accessing medical and dental care. This is why we worked hard to bring highly trained medical staff to remote areas, leading 55 medical and dental missions. 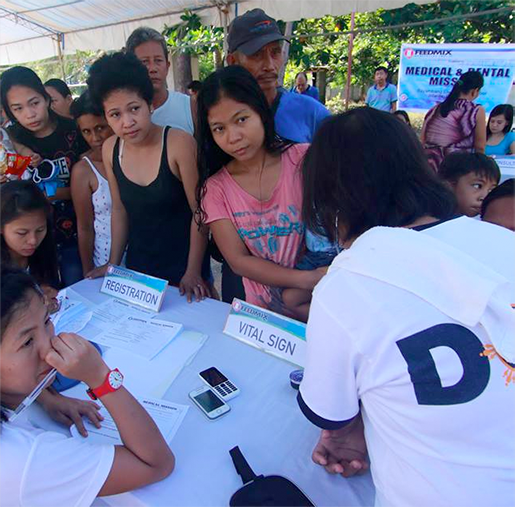 We ventured to multiple municipalities in Bolinao, Pampanga, Pangasinan, Bulacan, Batangas, Camarines Norte and Camarines Sur, and provided care to 11,827 people. Education – Feedmix has special focus on education, and we are dedicated to making investments in rural schools and the next generation. In Mount Pulag, students faced long daily treks down a rugged mountain terrain to attend the nearest school. After community consultations, Feedmix constructed a school, 11 classrooms, and a TLE facility, and donated school supplies and protective rain gear so 1425 students could study right in their community. We are also thankful to celebrate multiple occasions with the residents of Mount Pulag, including their children’s graduation ceremonies, and helped by providing 1000 meals so we could be part of their community’s bright future. Another group we work closely with is Dynamic Teen Company, and we are impressed by their tireless work in bringing education to street children. We donated educational books, took part in the Kariton Klasrum program several times, and funded their anniversary celebration and other events. Our initiatives with them to date have benefited 789 street children and Dynamic Teen Company members. Feedmix also supports students through other means. We donated school supplies, learning materials, and backpacks to a total of 400 students in Batangas and 1891 students in Pampanga. At the post-secondary level, we granted scholarships and bursaries to 22 college students—enabling them to study in state universities across the country. 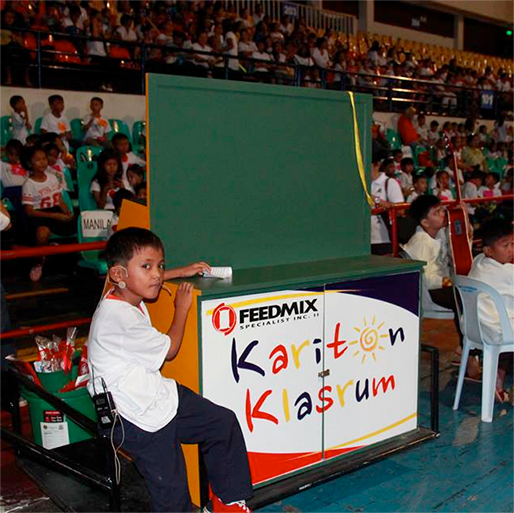 After a busy four years of strong social involvement, Feedmix is proud to continue our initiatives and serve Filipino communities across the country. We look forward to improving lives and livelihoods, and advance towards a sustainable future together.